We awoke to a nice sunny day again and the spectacular view that yesterday we were not sure was possible, was still there. Breakfast here is a little different. It is included in the fare and they supply all the things you want for breakfast and you prepare it. They give you a little menu that you just check off the things you want and magically they appear! I could get used to this. 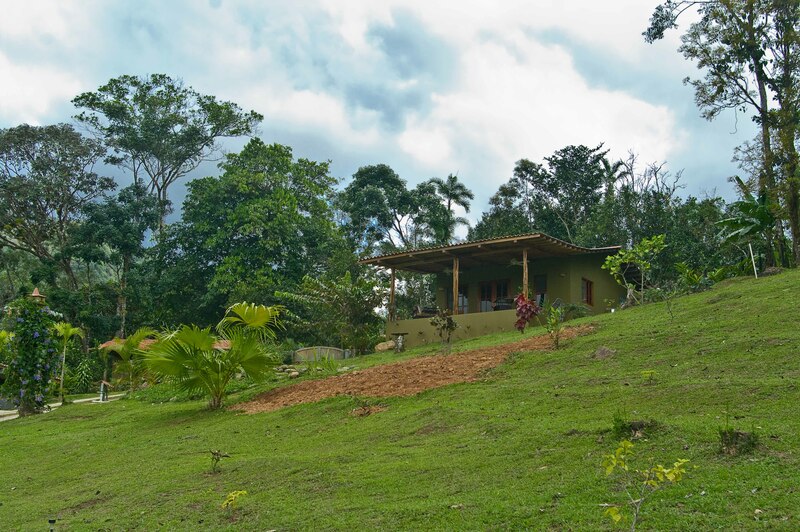 Fresh eggs from the chickens on the lot, fresh squeezed orange juice from the orange trees here and Erica’s fresh homemade bread are all delivered to your villa either in the morning or the night before. Rooms are tidied every day and the floors and outside patios and walkways are all swept as well. It’s a better job than you get in some higher end hotels. Each unit has a fully stocked kitchen. Here at Casa Mariposa they have an event that is a must try. It is an experience that you probably won’t get anywhere else! 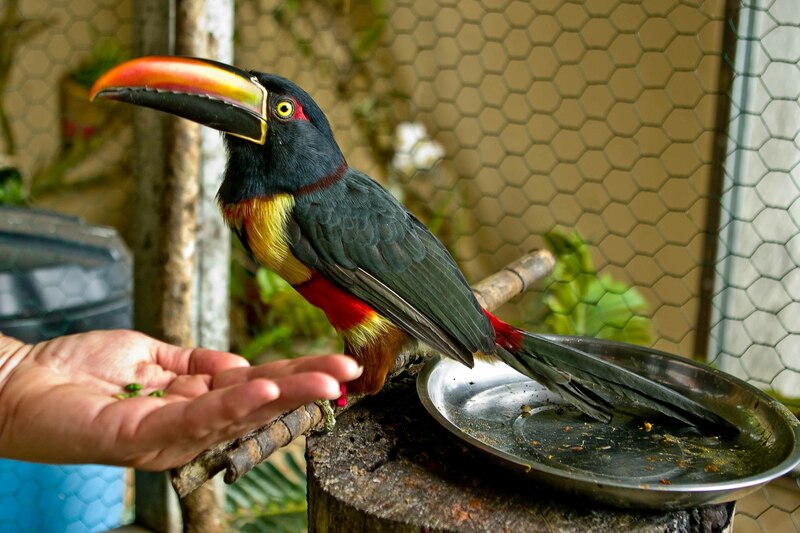 Its called “Lunch with the Toucans”. 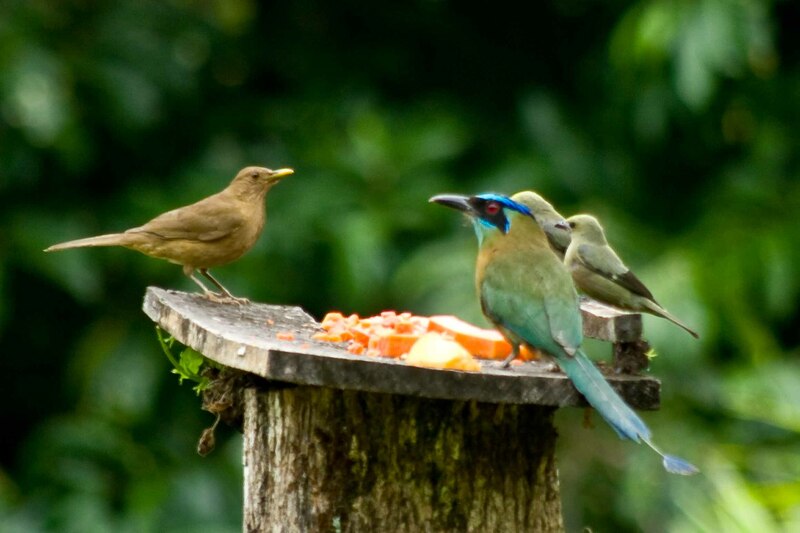 You order your lunch and when you are done that you go to the owner’s house where you will find a number of spotless aviaries containing a variety of large billed birds. Kevin and Erica have a registered bird sanctuary here. They specialize in large billed birds and take in injured birds that are brought to them by locals or birds that owners no longer can care for. 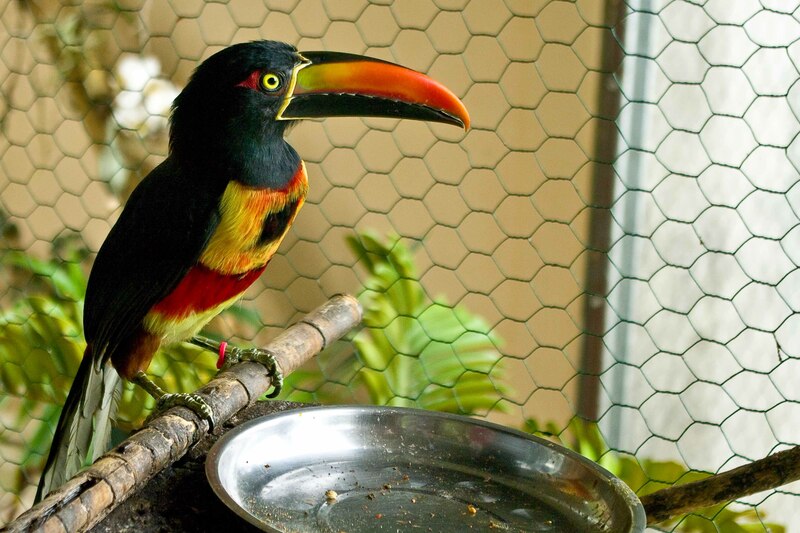 We have seen Toucans in the zoo but the condition of the birds looked nothing like these. 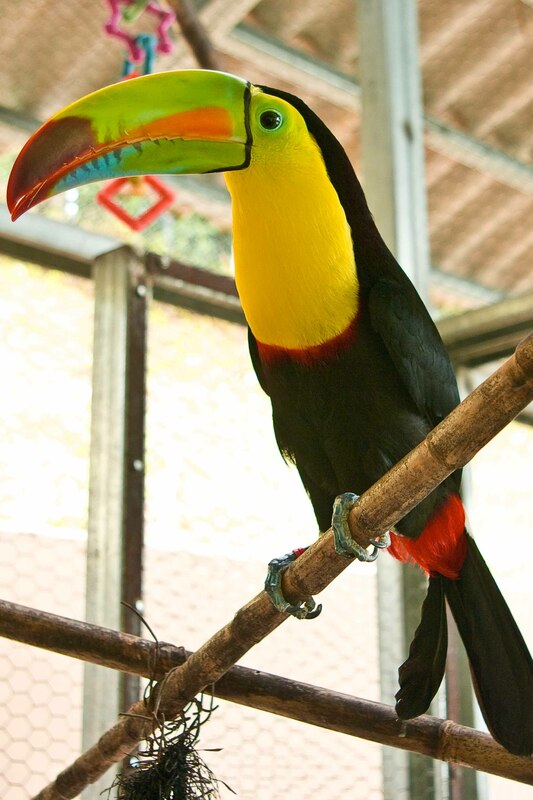 The Mariposa Toucans all have beautiful bright colors and look like they have just flown out of a Photo shopped photograph from National Geographic! Kevin attributes their condition to diet and that they eat 30 to 40 Kg of Papaya per week. 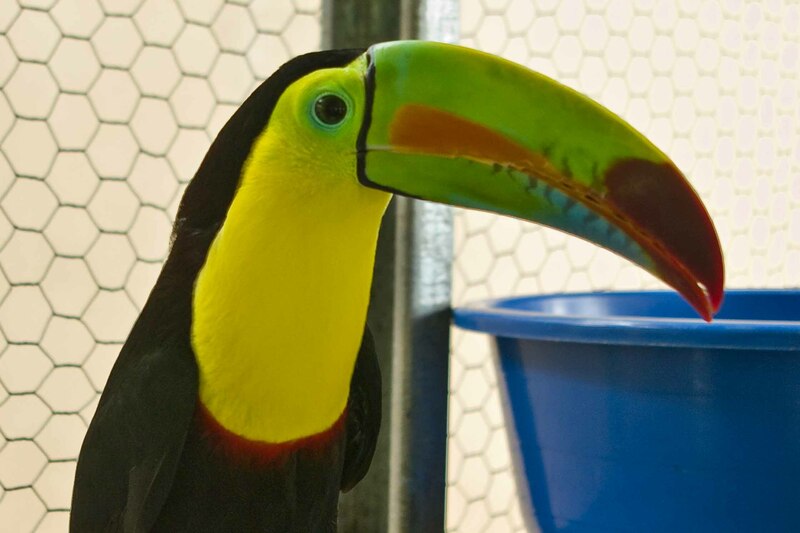 These Keel-billed Toucans love Papaya and it is in season all year round here! Kevin says that these birds are naturally curious and friendly. These are used to being around people so do not fly to the back corner of the cage and hide when you enter. They hop down on a branch close to you to meet and have a good look at their visitors. They will politely take food pellets from your hand and seem to enjoy the attention they get. Kevin tells us that these birds cannot be released into to the wild because they are too comfortable with people and that probably would get them into trouble if they were released. They live about 25 years in captivity. One pair are a breeding pair and it is their intention to keep the young birds as wild as possible so that they can be released back into the wild when they are old enough. There is also a pair of Collared Aracaris here. 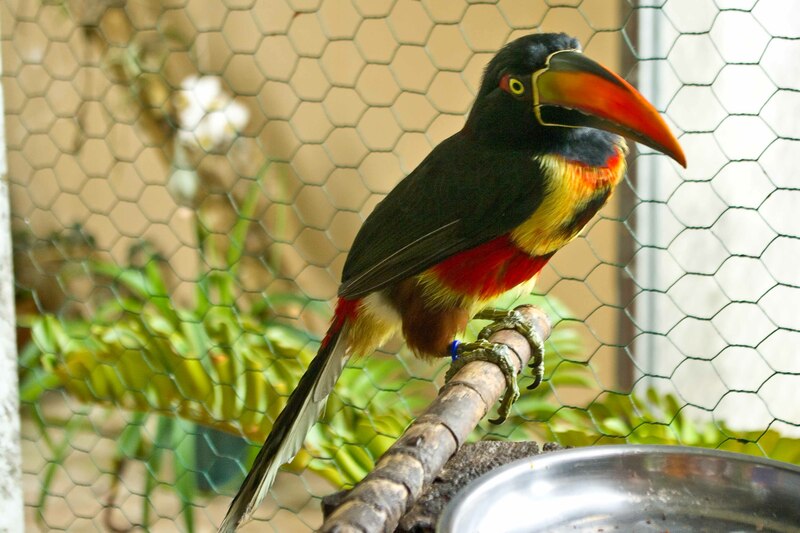 Along with their big colorful bill, they bear wide horizontal stripes of several colors across their chest and have a white outline where their beaks meet their heads. Such a show of color! Erica and Kevin present their spectacular birds to the public in such an intimate way that you can’t help but come away feeling that you have experienced something very special. You should not miss this! That is not the only thing that is special about this property. 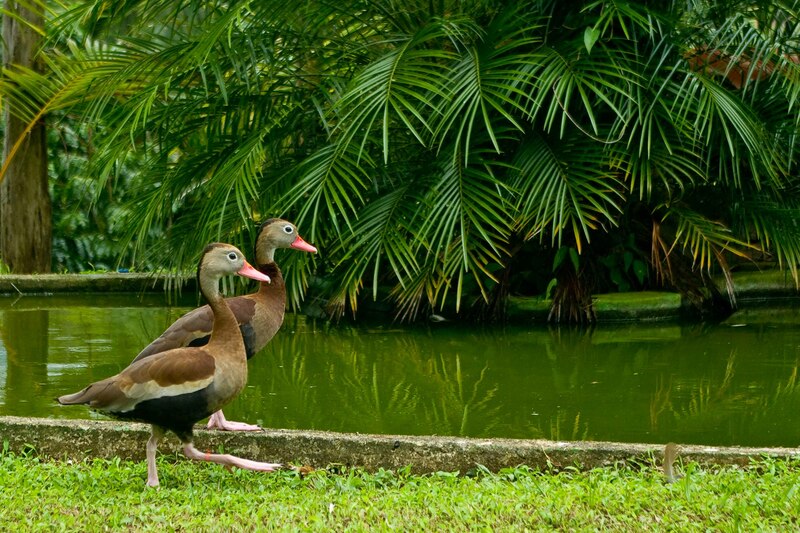 There is a small pond where a couple of Black Bellied Whistling Ducks, residents of Panama, have decided to move in and set up housekeeping. They are interesting because of their distinctive orange bills and that they are never very far from each other. They also have an unusual whistle and not the usual quack. Attention to detail around here seems to be the norm. There is careful attention to strategies that use nature to make living better. There are two-man made ponds on the property that have been stocked with carp. Mosquitos lay their eggs in the ponds and the carp eat the larvae. At the same time, there is a large red dragon-fly population here that also lays their eggs in the ponds but the carp do not eat these larvae. This provides a secondary defense against mosquitoes as dragon flies eat mosquitoes. There are also bats in the area that help with the mosquitoes. Bats eat their body weight in mosquitoes daily. Since our arrival we have noticed only the odd mosquito but nothing that could be considered problematic. 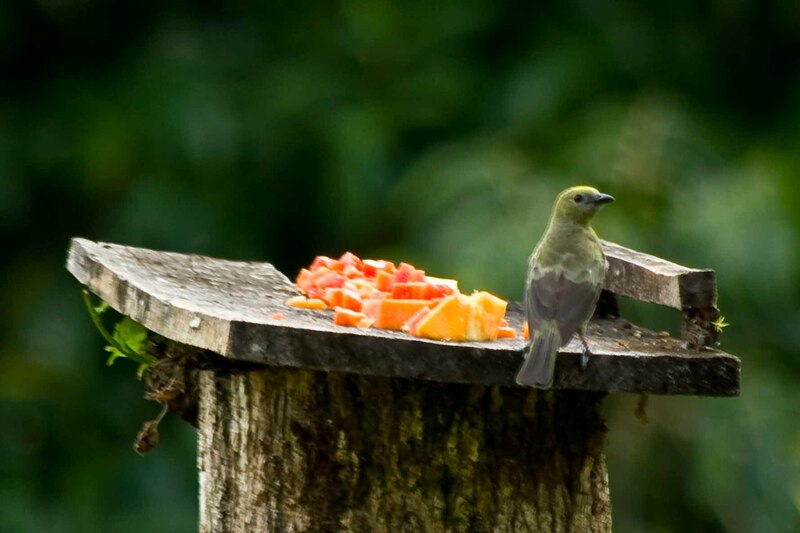 There are also a number of bird feeders around the property that are stocked twice a day. 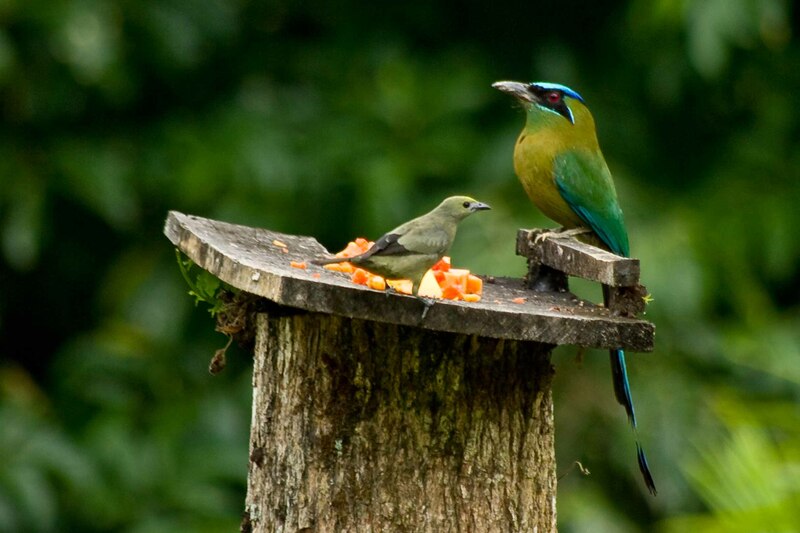 I spent some time at one of the feeders in the late afternoon and eventually caught a picture of a Motmot. 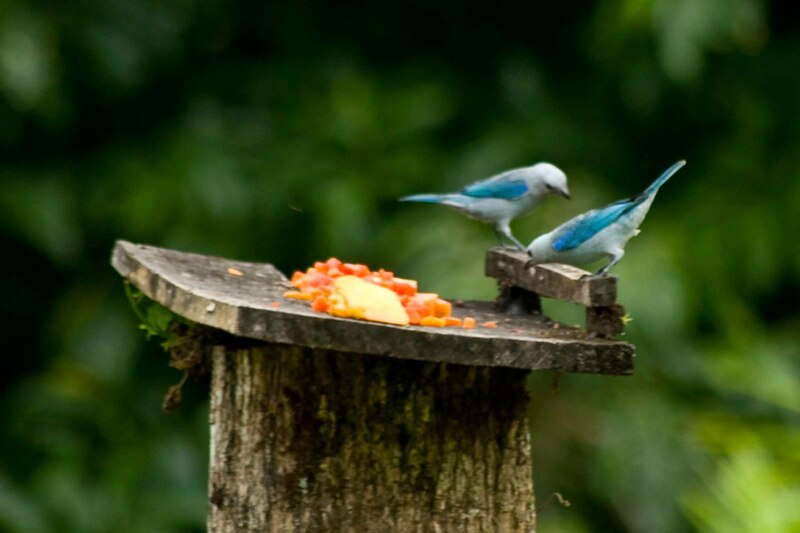 They are beautiful birds with a blue hat. The blue hat is not solid but rather just circles the head and the end of the tail has an interesting detail. 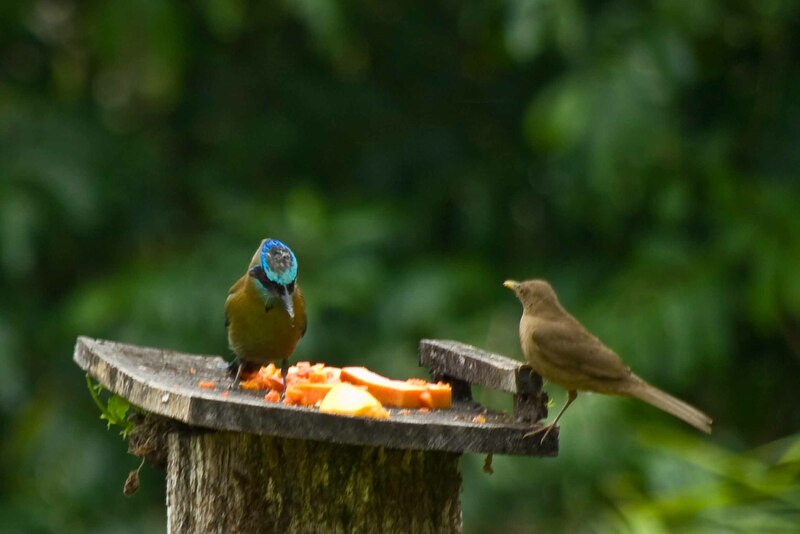 The little grey birds with the blue trim are Blue Grey Tanagers. Kevin tells us that most of the birds in this area are fruit-eating. wonderful, we must return in Panama to see that. It looks like bird’s paradise. Continue to enjoy !